Wobblers in dogs is a descriptive name given to a number of conditions affecting the cervical spine of large and giantbreed dogs. The end point of these conditions is a narrowing of the bony canal through which the spinal cord passes. The term ‘wobbler’ is used because it describes the characteristic ‘wobbly’ gait shown by affected dogs. The correct medical term is cervical spondylomyelopathy (CSM). Which breeds can develop wobbler syndrome? Certain breeds are particularly at risk of developing wobblers in dogs. These include: Dobermann Pinscher; Rottweiler; Basset Hound; Irish Wolfhound and Great Dane. The etiology of wobbler syndrome is not fully understood and it appears to have many contributing factors. Several factors thought to be influential in the development of wobblers in dogs include genetic predisposition and nutritional problems, such as a high protein diet. Nutritional factors have been incriminated for wobblers in dogs in the Great Dane (high protein food content), as well as breed conformation, head weight and carriage in the Dobermann Pinscher. 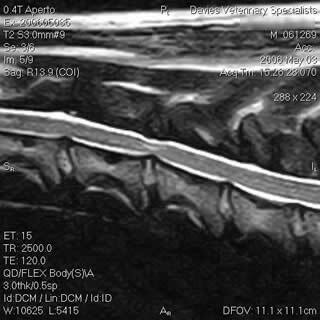 Middle-aged or older dogs which have degenerative changes of the vertebral column, ligamentous structures and joints with subsequent acquired narrowing of the vertebral canal. These acquired changes are superimposed on the previously mentioned developmental abnormalities and are responsible for a progressive clinical decompensation. The result of these changes is that the sensitive spinal cord becomes compressed to a greater or lesser degree. Compression of the spinal cord results in pain and neurological deficit characterised mainly by an abnormal gait. How would I know if my dog has wobbler syndrome? Usually, the initial signs of wobbler syndrome in dogs are fairly mild, e.g. occasional pelvic limb weakness, difficulties getting up from lying, scuffing of the toe nails. These signs progress in severity and affected animals often take short strides with the thoracic limbs and ‘goose step’ with the pelvic limbs. Lameness can occur if the nerves supplying an individual thoracic limb are ‘trapped’. 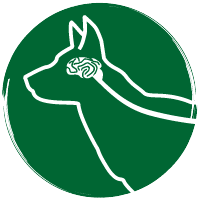 In order to see what is going on in your dog’s neck your vet will probably want to take some radiographs for which a full general anaesthetic will be required. A number of exposures are taken and often the study includes the use of a specialised technique known as a myelogram. Your vet may want to refer your dog to a specialist for this procedure. 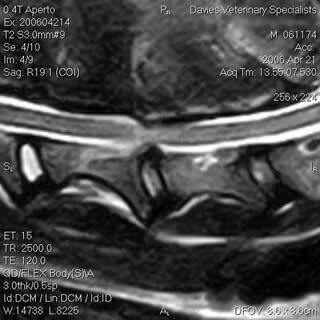 Newer techniques such as MRI give even better views of the spinal cord compression but are more expensive. From the images obtained, the nature of the problem in each individual case can be assessed. 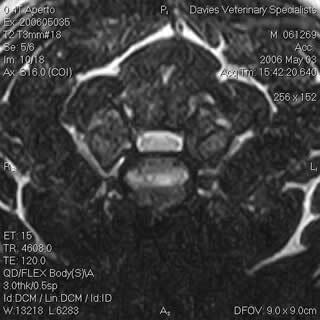 Your vet will want to identify the precise locations where spinal cord compression is occurring so that appropriate treatment can be planned. If untreated, dogs with wobblers will often get worse. Surgery may be required to improve the dog’s quality of life and to try and prevent further deterioration. In older dogs, or those which are considered a high surgical risk, non-surgical measures may be more appropriate. 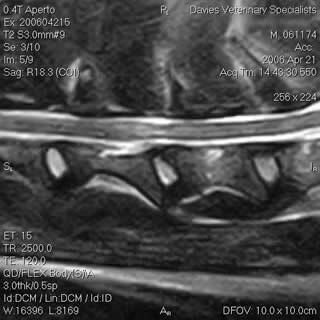 The images below show scans showing the spine of dogs with wobbler syndrome. Dobermanns are prone to a number of other diseases which can increase the risks associated with anaesthesia or surgery e.g. clotting disorders (such as von Willebrand’s disease), an under-active thyroid gland (hypothyroidism) or heart problems (cardiomyopathy). Your vet may recommend that your dog is tested for these conditions before surgery. Surgery is difficult, time-consuming and requires specialist expertise. The surgeon should explain the procedure and give an outline of the likely prognosis, as well as warning you of the potential complications. The outcome following surgery for wobblers in dogs is generally good but depends on a number of factors including: number and type of spinal cord compressions; duration of clinical signs prior to diagnosis; the dog’s weight and age. Unfortunately, it is not possible to discuss cases directly with owners before their animal is seen for an initial consultation.